My goal was to keep the style in my baby's modern gray and white nursery clean and fresh while keeping true to the form following function rule of good design. I also wanted the nursery's decor to blend and flow with the rest of our home so I chose to keep it simple and neutral. To accomplish this I layered textures and fabrics and bought furniture pieces that could later be used in different rooms of the house or updated for our little one in years to come. There are new items as well as items that we used that are leftovers from when we were children. Little details that have special significance to our family were worked into the nursery's design like the beagle silhouette outline is sewed on a little pillow to represent our dog Willy. We chose to buy a Stokke crib because in its smallest configuration we could use it as a bassinet in our bedroom and then convert it into a larger size when the baby sleeps in his own room. The style of the crib is exactly what I need in the modern gray and white nursery and I also liked that it has casters and can be easily moved around. I made the baby's bedding myself from simple, soft white cotton fabric that I bought at the local fabric store. I even made my own pattern using the mattress as a pattern. This was a great way to keep costs down since oval shaped bedding is not cheap. 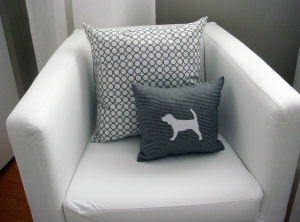 In addition to the white fabric used in the crib bedding two main fabrics are used throughout the space, a black and white houndstooth fabric and Metro Living Circles in gray by Robert Kaufman. I bought inexpensive containers to use as diaper changing caddies and recovered them with the houndstooth fabric. The little chair was passed down from my father, to me and my sister and now down to my baby boy. I stained the wood chocolate brown and recovered it with houndstooth fabric. I made the crib mobile using some lightweight wire, thread and buttery yellow paper. I made a paper stencil in the shape that I needed and traced it on the paper. Then I cut out a bunch and glued thread between 2 of the shapes. I strung 3 or 4 of the paper cutouts at varying heights on each thread. I used the wire to make a circular base and slid the thread with the shapes onto it. Ralph Lauren paint in a color called "Hopsack" and used Behr Polar Bear as the trim color. I ordered the large tree nursery wall decals with bare branches online and even though they were so tall, they were surprisingly easy to put up. I created most of the framed artwork that you see in the picture myself. I found free fonts that I could download online and through trial and error I came up with some stuff we really liked. As you can see, I stuck with the same color scheme, grays, browns and yellows, throughout. In the wall arrangement you will find a copy of the ultrasound, family pictures and a lovely shower card that I received from a close friend. There are some place holders in there that will have to be changed out once the baby is born (the footprints and the birth announcement!). One of patterns in the frame is eerily similar to a crazy bathroom tile we had in our previous home. Just little fun things that make the space a connection to our past and present. The whole frame wall concept is that I will be able to change out the pictures as time goes on. The light fixture is the Vibe pendant from Zone Maison. The carpet (Adum), bookshelf ( Expedit) white picture frames (Virserum), chair (Klappsta) and dresser (Hemnes) are all from Ikea. One of my favorite things we did was replace the knobs on the dresser with vintage glass knobs. The ladder/blanket storage was an easy DIY project made of wood 2x2’s that were then stained. I hung the blankets on the different rungs for easy access and to add visual interest. The little tv table beside the crib has been kicking around our home for years but with a fresh coat of glossy white paint and a dark tray on top give it now has a an updated look more in keeping with the style of our modern gray and white nursery. Angela, you have been one busy lady! 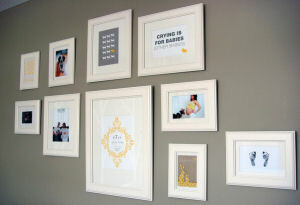 Your modern nursery ideas are fabulous and your "do-it-yourself" success is proof positive that parents that visit Unique Baby Gear Ideas can save money by doing some sewing and making some of the nursery decorations themselves! Thanks so much for sharing your amazing nursery pictures and if you have time, we would love to see some pictures of the nursery with baby in residence when he arrives! I just love the design and I appreciate the example. I am going to take your excellent ideas and add some "girl-y" colors to it for my project. It is so helpful to be able to see what other moms have done. Thanks everyone for the nice comments! The baby's room is so perfect! Many congratulations to you! I have a question about the bare branches wall decal. Could you please post the name and/or address of the online site where you found them? I love this nursery. I would not have picked these colors myself but seeing them together I see that this combination is very attractive and makes the room very gender neutral. With that being said, my favorite feature of the room is its gender neutral look and I do love the furniture in it. Love everything about this room! A touch of yellow is a perfect accent. I could see myself living in a room like this. Great job! oMG i want this nursery for my Kenzie!! I vote for this nursery for the nursery picture contest! It's stunning! Amazing. I love the work with the neutral colours. I never knew neutral colours could look so good. When can you decorate my nursery? Your decorating is so exciting, yet soothing. I can imagine a happy little baby boy/girl kicking their feet in the air, making funny little noises, and showing off a personality. Very beautiful... cozy looking nursery. Lucky baby! What color did you choose for the rug? BEAUTIFUL room! LOVE the colour scheme!! You're incredibly talented!! Congratulations Angela your babys room is so beautiful i dont just give 5 star i gave a 10 very well done. This is such a cool nursery - what a lucky baby! Angela, Wow! The nursery looks fantastic. I really enjoyed reading about the creative ways you designed the room and contents. I love the room! You did an amazing job Angela!!!! Angela I see you found your calling. The room you created is very unique and inspiring. 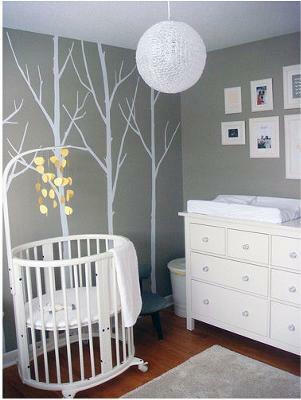 I absolutely love this nursery! 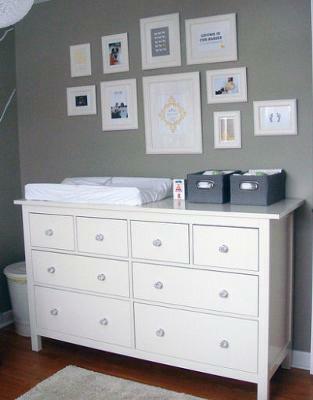 The colour scheme works really well and is so unlike what you usually find in a baby’s room. Great job Angela; it looks beautiful. into the design, nice personal touch. Great Work! This nurserie is so inviting, I would love to have a snooze there myself. Lovely work Angela. What a stunning nursery you have created. I love the clean lines and the inclusion of meaningful items in your decor. I love everything about this nursery! It's stunning & going to be a gorgeous space for the baby! Simple, yet elegant and functional. Lucky newborn to have such a talented mom. I love that it isnt cutesy and that it doesnt push traditional gender colours. The MOST beautiful nursery I have ever seen. No pink or blue here spelling out the design savvy of the decorator. The budget with DIY projects was kept in mind throughout. Wonderful job. Does Angela have a business or how can I contact her? Whow! I cannot believe the talent of this mother to be.The love and affection for their baby shows through at every angle. This is a tremendous job. I love it. This is an extraordinary work of simplicity and function. I would ask 'Angela' to design for me any day and feel confident with the outcome. This is the best nursery I've ever seen! Very inspiring. I love the homemade mobile! This is a beautiful room. I can't beleive this is a DIY. Lucky,lucky baby. He is going to be such a luck little boy! He is going to be such a lucky little boy! Outstanding design. Might only be surpassed by the manual labour that helped bring it together. absolutely gorgeous! I expect nothing less from this fabulous designer. ...but where does the PS3 go? Join in and write your own page! It's easy to do. How? Simply click here to return to MODERN NURSERY IDEAS.